As the end of another school year approaches many head teachers are beginning to plan ahead and budget for the new term, looking to purchase any required equipment before pupils and staff return in September. Choosing the right football goal for a junior school can be a challenging task due to the wide variety of sizes available on the market. The name of a product usually gives you a fairly good idea what it may be used for. However, feedback from our customer services team has established when it comes to purchasing football goals, a common misconception has developed surrounding the names of certain goals and the age group for which these are assumed suitable for. 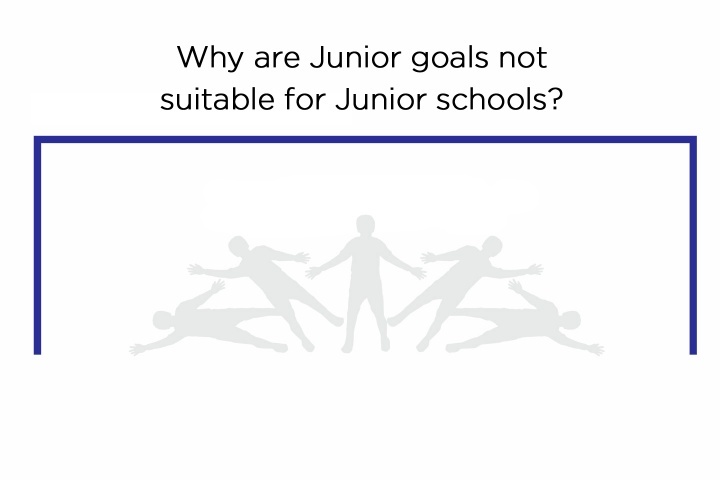 The term referred to as 'Junior' goals is often thought by sports coaches and teachers across the country to be suitable for use at 'Junior' (primary) schools, by children often aged between 5 and 11. Unfortunately, this is not the case as a 'Junior' goal measures 21ft wide by 7ft high making it only suitable according to FA regulations for use by 11 to 14-year-olds. 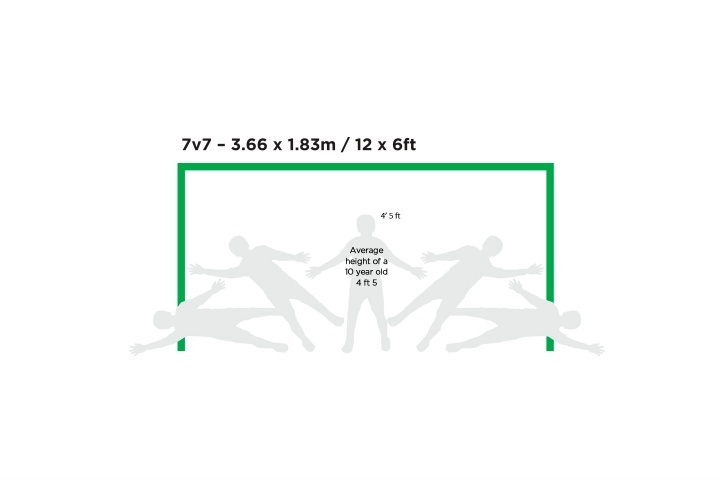 With the average height of a 10-year-old being 4 ½ feet you can see (below) how unsuitable the size of a junior goal is in comparison to a '7v7' goal which we would recommend is more proportionate for children aged 7 to 11. 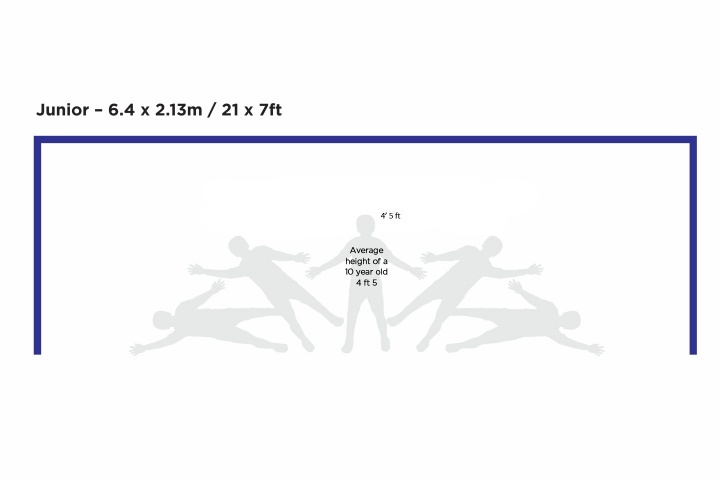 As you can see we have demonstrated within a 'Junior' (21ft wide and 7ft high) and '7v7' (12ft wide and 6ft) goal the effect the wrong size football goal has on an average 10-year-old's dive ratio and coverage. The 'Junior' goal has up to 45% of the goal area uncovered during the dive, whereas the '7v7' goal has less than 10%, making it much fairer on the goalkeeper. Which size goals should I buy? 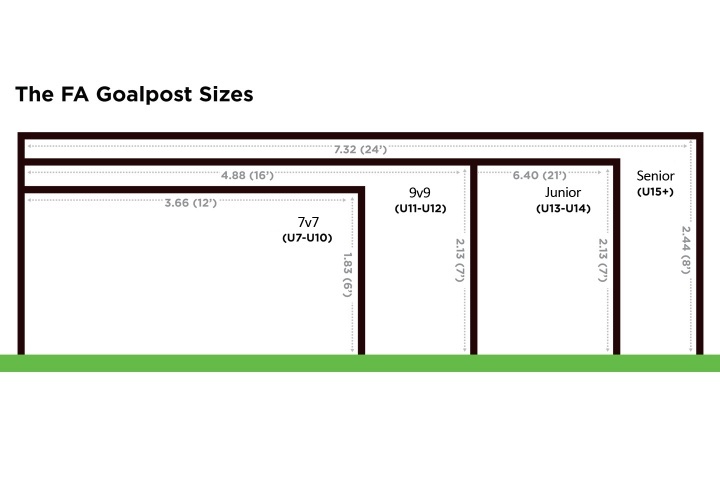 To help make life easier when trying to determine the right size football goal for your school, we have compiled an easy to use buyer's guide below listing our recommendations on the goal size and type most appropriate for each intended level of play and key stage. The importance of providing the right football goal for children is paramount. It means schools meet FA regulations and ensures that pupils are not daunted by goals which, in many instances, are far too big for them. This guide will help schools make the correct choice at the first time of asking, thus avoiding further headaches or subsequent delays caused by the need to return large items. If you do require more information, advice or support then do not hesitate to contact us on 01502 583515.